Depth of Field is probably one of the more challenging areas of photography to understand. In this graphic, the black line at 15′ is critically sharp. This is where the lens is focused. The yellow represents the Depth Of Field. Let’s begin with a workable definition. Depth of field is that area of an image that is considered acceptably sharp … in other words it appears to be ‘in focus’. There now, don’t you feel much clearer on this subject? NO! Well, not to worry. It is not as hard to grasp as you might fear. To understand what the term acceptably sharp really means, it helps to know what actually happens when you focus your lens. The first thing to understand is that the lens can only render one single plane at a time in critically sharp focus. This is important and has a great deal of bearing on depth of field. When the lens is focused at say 15 feet, everything that is 15 feet from the lens will be in ‘critically’ sharp focus. Anything closer than 15 feet and anything beyond 15 feet becomes gradually less and less in focus until at some point this lack of sharpness will be quite noticeable. So now you have a critically sharp plane (15 feet in this example) and an area of gradually decreasing sharpness. And finally an area that is plainly out of focus. That area of your picture that still appears to be sharp to your eye is called the “depth of field”. Naturally, this term ‘acceptable sharpness’ is somewhat subjective. The final intended use of the image as well as the individual’s own personal standards will determine what is acceptable and what is not. For example, a professional with a highly trained and critical eye may require a much higher level of sharpness than someone who is just taking pictures they can email to friends and family. The actual DOF is not a precise measurement. The size of the image and the distance from which it is viewed, as well as the subject matter itself can influence what will appear acceptably sharp and what will be obviously out of focus. A small print viewed from a few feet away will often appear quite sharp. However, when the viewer sees a larger print of the same image the area of sharpness will be reduced … in other words it’ll have less DOF. 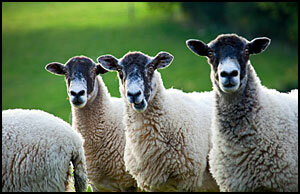 In the small image to the left all 3 sheep appear to be acceptably sharp. Click the image to see a larger size and the area of acceptable sharpness will be greatly reduced. Note:The image you see will be sized for your monitor, but there’s a Full Size link on the bottom of the viewer. Also, in a subject with fine details you’ll see a lack of sharpness more readily than in a subject that is less detailed. A good example is the human face. If the eyes are not sharp you’ll notice it right away. But if the cheeks or nose are not critically sharp it will be less apparent. Naturally, the size and quality of your image sensor as well as the quality of your camera’s optics will also have an effect on overall sharpness and can limit the area that is considered acceptably sharp. The important thing to keep in mind about DOF is that it is not a precise area that is sharp in every instance … the area that is considered to be acceptably sharp will vary depending on the final image and the standards of the individual photographer. In Depth of Field – Part 2 we’ll look at how you can control DOF. Your comments are always welcomed … they help me improve the content on the site and provide me with ideas for additional articles. How do we increase the depth where objects are critically sharp?